The Sister Season is just not my cup of tea. I like happy, light-hearted reads and this book is anything but happy and light-hearted. It is well written and includes great characters. The characters were dimensional and certainly realistic. The underlying tone is what I consider dark for a story that is set around Christmas, but the situations are real life situations that lots of people are having to deal with regardless of the time of year. Some may find some of the scenes intense as the book deals with domestic abuse and suicide — but both are written about in a very delicate manner and never in any extremely violent detail. It is a pretty quick read as the story flows and there is so much going on you what to know what happens next. Overall, it is well-organized with great characters, but the whole book just lends itself to emotional overload. 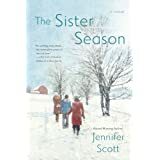 This is definitely not a fun light-hearted Christmas read, but if you want deep soul-searching, heart-wrenching family drama at its best this is your book.